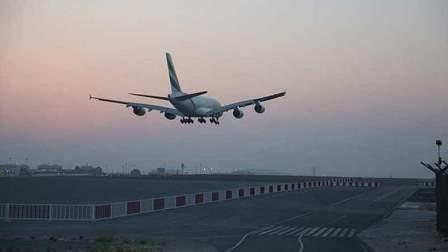 Dubai International Airport (DXB), the world's busiest for international traffic, will close one of its two runways for 45 days in 2019 to conduct a comprehensive upgrade designed to boost safety, service and capacity levels. Dubai Airports, operator of the emirate's two international airports, said on Monday that the southern runway of DXB would be closed from April 16 to May 30, 2019, for resurfacing and replacement of ground lighting and other infrastructure. DXB, which handled 88.2 million passengers in 2017, operates 24x7, 365 days per year with over 1,100 daily aircraft movements featuring predominantly wide-body aircraft. The partial closure will result in capacity reduction, as airlines will have to scale back their operations during the 45 days, Dubai Airports said. Next year's runway closure will be the second for the world's busiest airport in five years. In 2014, DXB operated with one runway for 80 days for upgrade and repair work on both its runways. It had cost the Emirates Group an estimated $467 million in lost revenue, according to its financial statements. Dubai Airports said airlines would be able to use Dubai's second airport, Al Maktoum International, located about 60km away at Dubai World Central (DWC). The new airport is being expanded and plans call for it eventually to be even bigger than Dubai International. DWC is currently undergoing the completion of an expansion programme that will boost its capacity from 5-7 million passengers per year to 26 million passengers per year. "In the months ahead we will be working closely with Dubai aviation engineering projects, airlines and other stakeholders to ensure we optimise service and capacity during this period next year and minimise the impact on our customers," said Paul Griffiths, Dubai Airports CEO. "While we regret any inconvenience this may cause to our airline customers and our passengers, these upgrades are absolutely necessary to heighten safety, boost capacity and pave the way for future growth," said Griffiths. A spokesman of Dubai Airports told Khaleej Times it is too early to estimate the extent of the impact on passenger numbers but in terms of flight movements the reduction in capacity during the 45-day period is estimated to be around 43 per cent. "To limit the impact on service, the upgrade work is scheduled to take place from April 16 to May 30, when passenger traffic historically ebbs due to a seasonal lull," Dubai Airports said. "During the closure period, airlines will be required to reduce their operations to DXB due to the significant capacity reduction resulting from single runway operations. Dubai Airports has provided additional advance notice to all airlines to plan for the flight reductions and schedule planning," said the operator. Saj Ahmad, an analyst at London-based StrategicAero Research, said the planned closure for runway upgrade next year would impact operations partially, but with Dubai World Central able to take and handle flights, the upgrade process should be relatively straightforward. Given that the airport has already undergone maintenance like this before, the knowledge, experience and flight management will help to offset delays while allowing the northern runway to pick up the slack," he said. "In the interim, there may be some flights at Emirates and flydubai, the biggest two operators at the airport, that are curtailed to keep schedules in check. But that's still all at an exploratory stage right now," he added. While ongoing runway maintenance is scheduled on a weekly basis, more extensive upgrades require a complete closure of the runway. Such is the case with DXB's southern runway, which is nearing the end of its design life and requires complete resurfacing and replacement of the airfield ground lighting and supporting infrastructure. The southern runway refurbishment project will involve the placement of approximately 60,000 tonnes of asphalt and 8,000sqm of concrete to strengthen and resurface the runway and the adjacent taxiways. Dubai Airports will also use the opportunity to install 800km of primary cables and replace over 5,500 runway lights with more modern, economic and environmentally friendly technology.